364 pages | 9 B/W Illus. The 22nd Annual Meeting of the International Police Executive Symposium was held in August 2012 at the United Nations Plaza in New York. Chaired by Dr. Garth den Heyer, the symposium focused on the links between economic development, armed violence, and public safety. 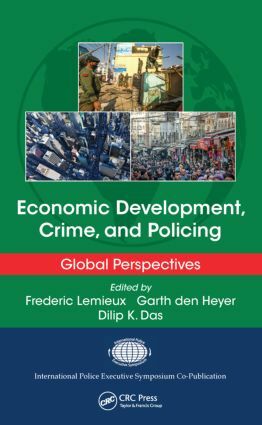 Drawn from these proceedings, Economic Development, Crime, and Policing: Global Perspectives presents the insight of police leaders and researchers from a number of countries. They provide worldwide perspectives and case studies about the complex interrelations and influence of these issues on police practice in developed, developing, and transitioning countries. The book organizes these topics according to regional perspectives (global, modern democracies, emerging democracies, and newly industrialized countries). It highlights ongoing response efforts related to challenges facing the police in emerging or newly democratized states. The book concludes with a comprehensive review of the fundamental elements of police reform and explores how such changes might affect society. It discusses the role of society in reforming police systems and suggests new directions for this broad research agenda. This book is a co-publication with the International Police Executive Symposium. Frederic Lemieuxis a professor and director of police science and Security & Safety Leadership Programs at the George Washington University, Washington, D.C. He received his PhD in criminology from the University of Montreal, Canada, in 2002. Dr. Lemieux’s research has focused on social control and policing. He is currently conducting studies on transnational drug trafficking enforcement and on the function of criminal intelligence as a formal social control tool. Dr. Lemieux has also published three books and various journal articles examining crime control during major disasters, counterterrorism and intelligence agencies, and police cooperation. Garth den Heyeris an inspector with the New Zealand Police. He is also a senior research fellow with the Police Foundation in Washington, D.C. He received his doctorate in public policy from the Charles Sturt University, Manly, Australia, in 2006. Dr. den Heyer’s research has focused on police service delivery effectiveness and police reform in postconflict nations. He is currently conducting research on the cost-reducing strategies adopted by police agencies to maintain effective and efficient delivery of services. Dr. den Heyer has also published three books and various journal articles examining police structures and performance, policing in developing nations, and the police’s role in countering terrorism. Dilip K. Das has extensive experience in police practice, research, writing, and education. A professor of criminal justice, former police chief, founding editor-in-chief of Police Practice and Research: An International Journal, Dr. Das is a human rights consultant to the United Nations. Founding president of the International Police Executive Symposium, Dr. Das has authored, edited, and coedited more than 30 books and numerous articles. He has traveled extensively throughout the world in comparative police research, as a visiting professor in various universities, and for organizing annual conferences of the IPES. Dr. Das has received several faculty excellence awards and has been recognized as a Distinguished Faculty Lecturer. The International Police Executive Symposium (IPES) was founded in 1994 to address one major challenge, i.e., the two worlds of research and practice remain disconnected even though cooperation between the two is growing. Research is often published in hard-to-access journals and presented in a manner that is difficult for some to comprehend. On the other hand, police practitioners tend not to mix with researchers and remain secretive about their work. Consequently there is little dialogue between the two, and almost no attempt to learn from one another. The aims and objectives of the IPES are to provide a forum to foster closer relationships among police researchers and practitioners on a global scale, to facilitate cross-cultural international and interdisciplinary exchanges for the enrichment of this law enforcement, to encourage discussion, and to publish research on challenging and contemporary problems facing the policing profession. The IPES facilitates interaction and the exchange of ideas and opinions on all aspects of policing, and is structured to encourage dialogue in both formal and informal settings. The International Police Executive Symposium (IPES) holds annual meetings of policing scholars and practitioners who represent many countries. The best papers are selected, thoroughly revised, fully updated, meticulously edited, and published as books based upon the theme of each meeting. This repository of knowledge from renowned criminal justice scholars and police professionals under the co-publication imprint of IPES and Routledge (formerly CRC Press) chronicles the important contributions of the International Police Executive Symposium over the last two decades.